We previously reported that the whole world was (rightfully) losing its mind over a mysterious countdown that Taylor Swift added to her website. Since then, the countdown has become even more wide spread and wildly speculated! On top of the highly anticipated date (April 26) now being featured in both her Instagram and Twitter bios, it’s been popping up all over the world! Fans initially spotted it in New York’s Times Square (which makes sense since Swift calls New York home), but it’s also popped up in cities from Europe to Australia! 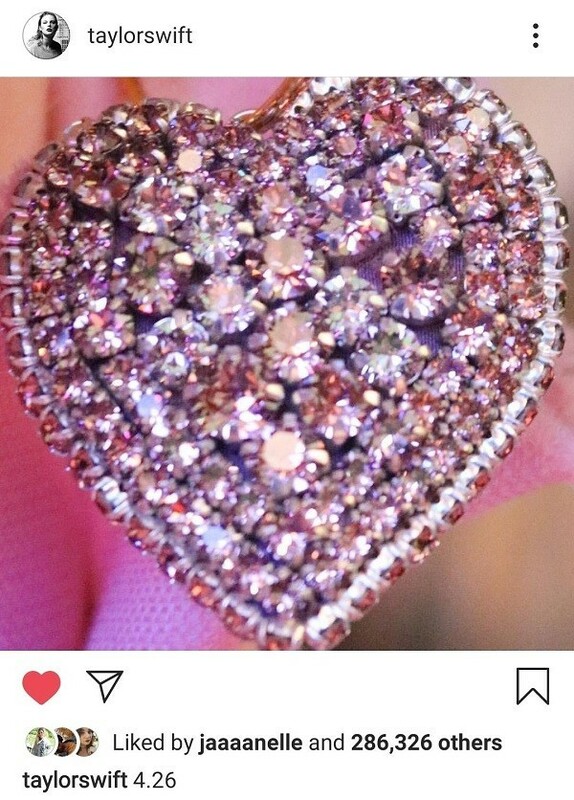 Taylor also posted this picture of a pink diamond encrusted heart with the April 26 date on her Instagram account. 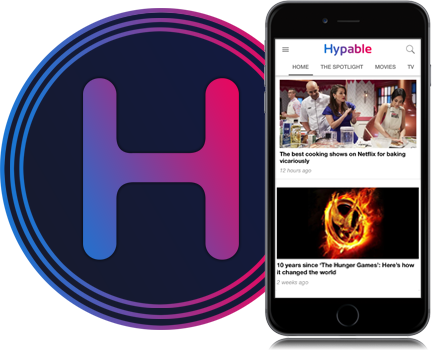 The countdown to whatever is coming is blowing up now, but it’s actually been a long time coming. 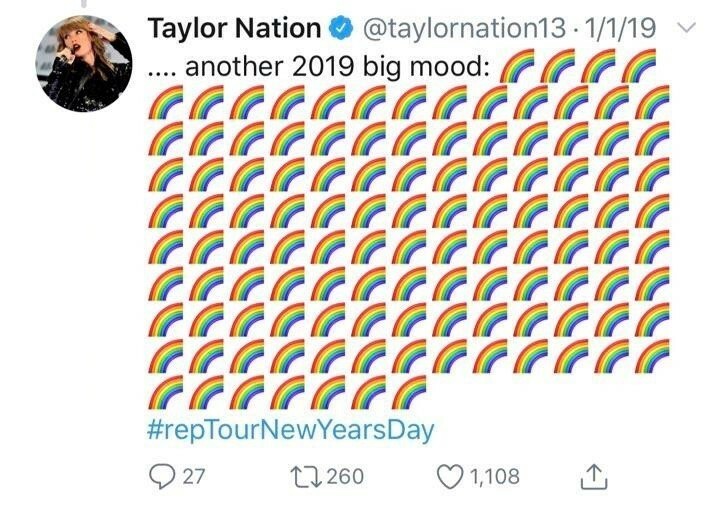 On January 1, Taylor Nation tweeted 115 rainbow emojis. 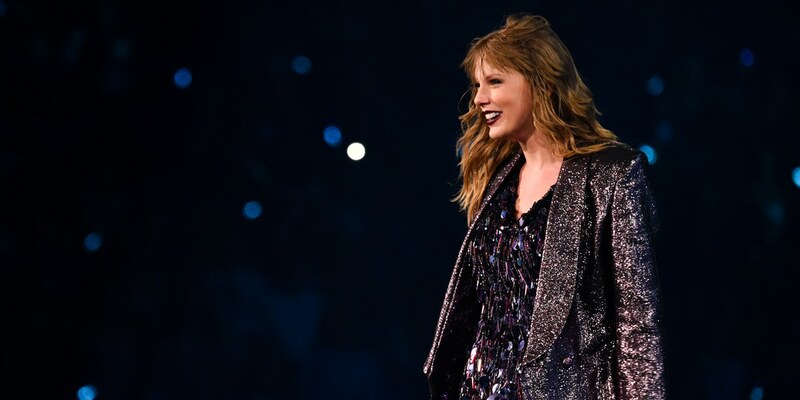 The tweet mentioned the Reputation Stadium Tour that premiered on Netflix that day, but it also teased something “big” in 2019. April 26 is 115 days into the year, so Swifites started speculating then that something would happen at the end of April. Then, on February 24, Taylor seemingly began a new countdown. 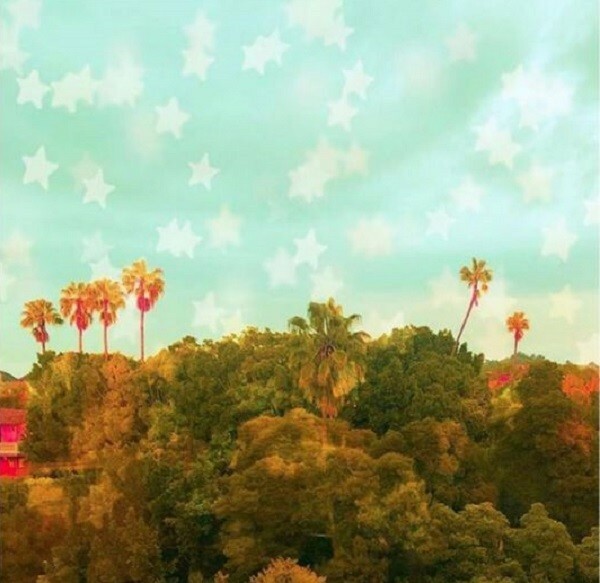 She posted the following three pictures that, looking back, have similar coloring and imagery to the countdown currently on Taylor’s website. The first picture featured seven palm trees (with a caption of seven palm tree emojis to suit). Taylor Swift’s next studio album will be her seventh, so speculation about #TS7 really picked up here! Over the next two days, she posted a pink-washed picture of herself on a staircase with a pink heart caption (to match the diamond heart she just posted?) 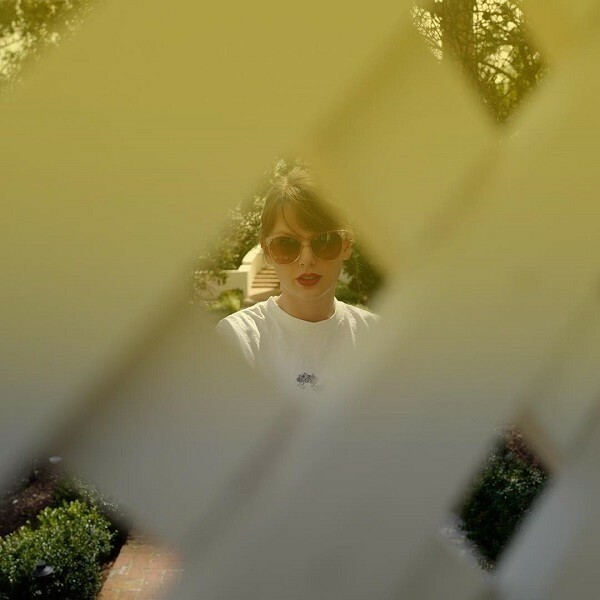 and a yellow-washed picture of a fence with a yellow heart caption (to match the yellow ray of light on the countdown??). The imagery surrounding all of these posts is a huge departure from that of her 2017 album, Reputation. However, it’s not too far off of the 1989 aesthetic. That album also used clouds and pastel shades of blue and pink. If new music is coming, this could be a hint at the style we can expect. It seems clear that we can expect something different from the edgy, heavily produced pop tones she delivered in Reputation, but what’s next? Could she be going straight back to the sweeter pop sounds of 1989? The @TaylorNation13 twitter account has been busy retweeting pictures and theories for the countdown. Of course, most of these theories involve new music, and given the magnitude of the countdown, at this point, I feel certain that’s what it is. Maybe she’ll drop a full album on us, but it’ll likely be the first single for the #TS7 era with an album announcement to follow. I think we can all agree that we’ll be highly disappointed if this countdown is leading to the announcement of a single stage performance or the trailer for Cats or something. If you’re going to hype Swifties up this much (which admittedly isn’t that difficult), you need to deliver. Anything short of new music will be less than satisfying, but there could be some other outcomes that would legitimize the hype. On the off chance that we won’t be getting new Taylor Swift music on April 26, I thought of some other things I could live with. In honor of the potential #TS7, here are seven theories that are so crazy they just might be true, but almost definitely aren’t. When I see a diamond ring I think of one thing, and the only music involved is wedding bells. Other than the countdown, Taylor’s only post about April 26 has been a large heart-shaped diamond ring, which has engagement ring written all over it! Also, the pink staircase picture that Taylor posted in February was taken at an event she was at to support her boyfriend, Joe Alwyn’s movie, The Favourite. 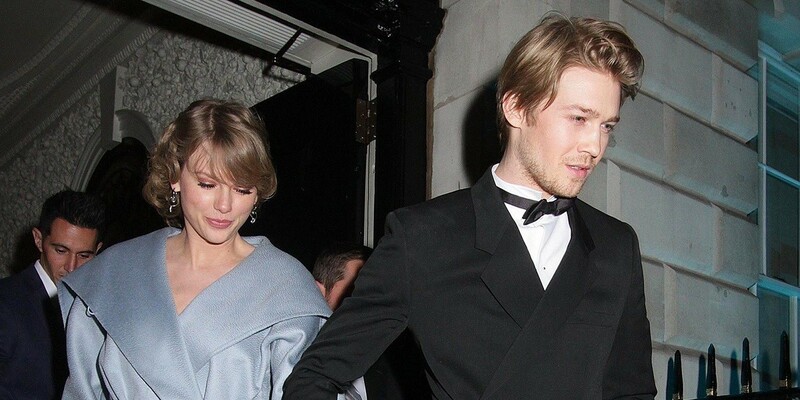 Taylor and Joe have been going strong since before Reputation was released, so maybe they’ve decided to tie the knot. I think Swifties would be very excited to hear that news. However, for this to warrant a countdown, the wedding would have to be televised…and huge. Like…stadium tour huge. I’m picturing Taylor being aerial lifted to a stage in Madison Square Garden singing “Enchanted” while Joe waits, completely enamored, below. There would be multiple live performances throughout the event and Taylor Swift’s cats would be the flower girl and ring bearer. A huge double rainbow would shine over the event as a sign of the heavens blessing the union. Given how private Taylor and Joe have kept their relationship, this has about 0.0013% chance of happening…but there’s a chance! Believe it or not, April 26 was a highly anticipated date before Taylor Swift had anything to do with it! 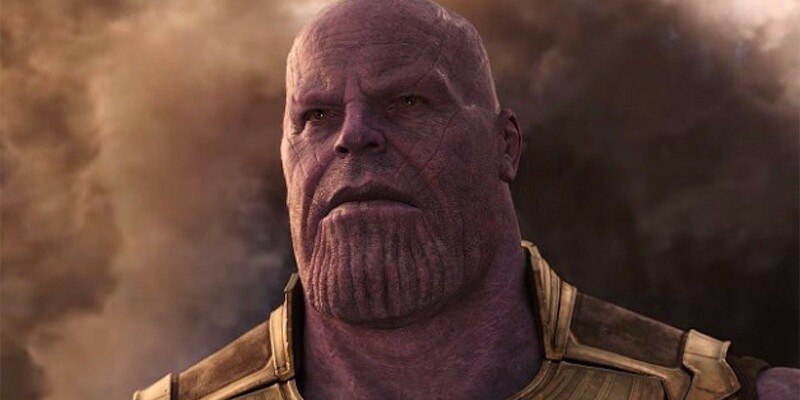 It’s also the premiere date for Avengers: Endgame. 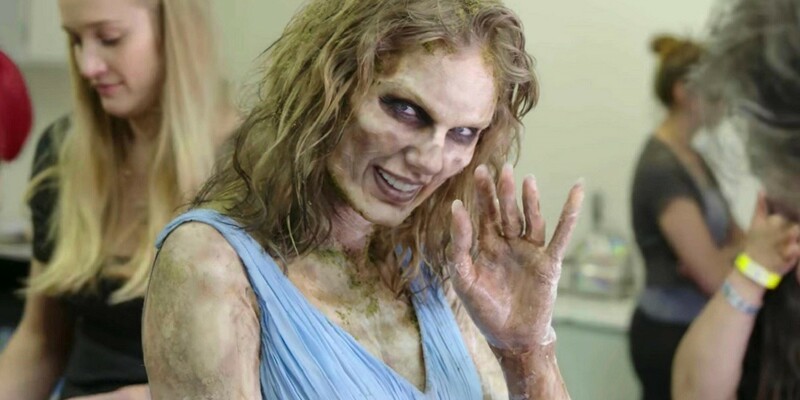 The only way I could accept Taylor’s countdown as being a countdown for Endgame is if she’s secretly in the movie, and is the one to bring Thanos down in the end. Disclaimer: As both a Swiftie and a Marvel fan, I absolutely do not want this to happen, but it would be so crazy it might be worth it. Maybe they could play it Breaking Dawn style and have this be a possible ending that Doctor Strange sees. Palm trees and pink sounds like Vegas to me! Of the options I’ve explored so far, this one is the most plausible. Even though it would mean that Taylor wouldn’t be doing any big tours for a while, the possibility of being able to go see her literally any night of the year is pretty enticing. If, like I speculated earlier, Taylor is getting close to settling down, Vegas could be a great next step that would allow her to live in one place and still perform. Also, she could put together an incredible stage show with all of her hits. Okay, it’s probably too early in her career for her to consider this, but I now need this to happen at some point. There were some pretty insane rumors floating around during the Hiddleswift era, and one of my favorites was that they were never together, but were simply filming a visual album. Maybe it was true and she’s finally deciding to release it. Avengers day would be the perfect time to release it, since Loki love will be on the rise, whether he’s in the movie or not. With the imagery she’s giving us in this countdown, it could even just be a visual album of 1989. I’d take that, but a new visual album starring Taylor Swift and Tom Hiddleston would honestly be the best case scenario. Taylor Swift has been widely criticized for her silence surrounding politics, so what if she did a full 180 and announced that she was running for president! This one is even less likely than the televised wedding, but can you imagine Taylor and Kanye duking it out in a presidential debate? Saturday Night Live, please do something with this. A magical land filled with palm trees, rainbows, and unicorn cats could be coming to a theme park near you! There’d be a getaway car ride, a Nashville themed area, a rollercoaster that takes you through the entire 1989 journey…there are endless possibilities. Even a Taylor Swift themed roller coaster would be amazing, but not worth the countdown. It’s a full theme park or bust. I don’t even want to discuss this one because it would mean having to think about it, but the countdown backdrop is a sunset. That’s all I’ll say. What do you think Taylor Swift is counting down to on April 26?